SPECIAL NOTE: For the third year in a row the finish line was again on Roubaix's Avenue des Nations-Unies in front of the headquarters of major sponsor La Redoute. 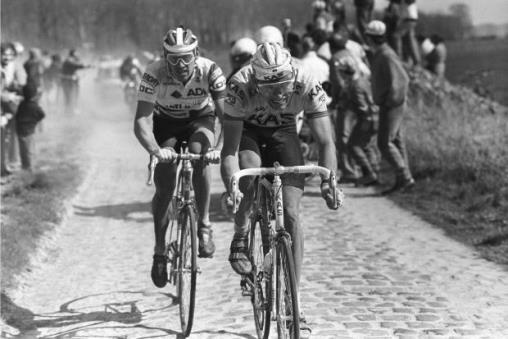 Most Belgian’s dream of a Paris-Roubaix victory in 1988 Dirk Demol (Bel) made it a reality. His team ADR manager Jose De Cauwer chose Demol as the eighth and final team rider for the “Queen of the Classics”. Demol would not disappoint his team. Demol’s job was to answer the early attacks, so when Frenchman Thierry Casas made the move 44 kms into the race Demol was one of 12 riders to join the breakaway. The peloton did not react and the breakaway built an 8 minute plus lead entering the first cobbled section at Troisvilles. The brutal 5-star cobbled section in the Arenberg Forest would shatter the breakaway group. Crashes and punctures split the group with only 7 riders exiting Arenberg in front. Giudo Bontempi escaped from the peloton and began to cut into the leaders' time gap. The leaders increased their pace and moved the time gap out again. Through the Carrefour de l'Arbre cobbles, 14 kms from Roubaix, Demol and Thomas Wegmuller (Sui) dropped the last of their breakaway companions. The first chase group was still over 2 minute behind. When the pair hit the streets of Roubaix disaster hit Wegmuller. An errant plastic bag floated across the road and got stuck in the Swiss rider’s derailleur. Unable to shift Dirk Demol easily out sprinted Wegmuller to gain the victory after a breakaway of 222 kms!!!! This Belgian’s dream was realized. 1. Dirk DEMOL (Bel) 6h34'18"
2. Thomas Wegmuller (Sui) +2"
3. Laurent Fignon (Fra) +1'55"